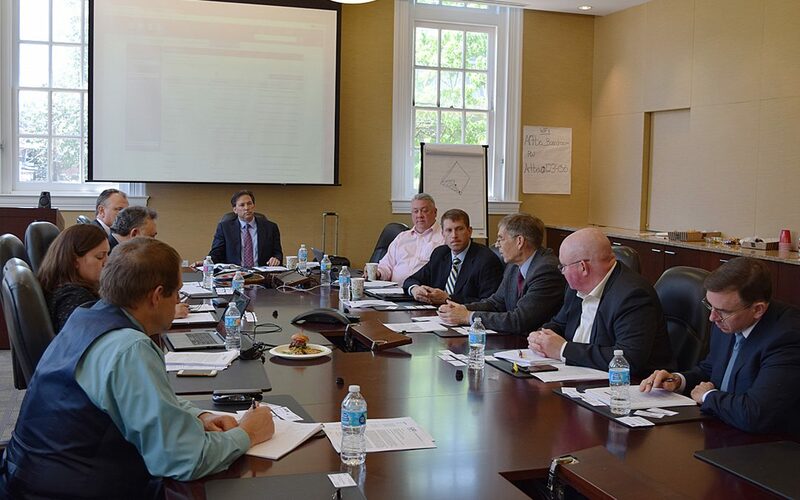 Members of the ARTBA Breaking Down Barriers to Innovation/Proprietary Products Task Force May 16 discussed with Federal Highway Administration (FHWA) officials the benefits and challenges of using proprietary and patented products on federal-aid highway projects. The FHWA invited ARTBA to share its perspective as part of an internal agency review of the existing proprietary products regulation that precludes the use of proprietary and patented products or processes on federal-aid projects, except in several limited circumstances. ARTBA members explained that while the regulation was initially intended to ensure competition, it has evolved to become an impediment to innovations that could lead to longer lasting, less costly infrastructure improvements. The ARTBA task force presented the agency with a series of recommendations to improve and/or repeal the current regulation. ARTBA worked in 2011 to secure guidance from FHWA to its division offices and state transportation departments that was intended to clarify how and when proprietary products could be used on federally-supported projects. ARTBA members participating in the meeting were: John Hillman, HCB, Inc. (task force chairman); Lester Hensley, EMSEAL; Eric Hedman, 3M; Dan Hickey, 3M; Mark Henderson, LJB, Inc.; Mike Stenko, Transpo Industries, Inc.; and Kevin Groeneweg, Mobile Barriers, LLC.